Lothians interest – packed out meeting! Perhaps our biggest ever meeting, there was great interest in the 4 talks, followed by a challenging hour of questions and discussion. 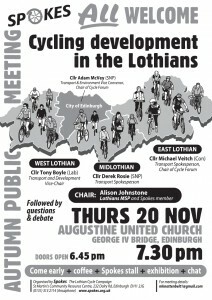 A hands-up showed around 40 people who had travelled in from the Lothians, and virtually everyone in the audience had used a bike in the Lothians at one time or another. Government cycle funding is vital. The 14/15 increase (from roughly 1% to nearly 2% of total transport spending) distributed via the Sustrans Community Links 50/50 match-funding scheme had made a really noticeable difference – as the West Lothian talk in particular had shown. It was vital for this to continue, and worrying that the draft 15/16 budget suggested that Scottish government funding for cycling infrastructure looks set to be lower than in 14/15. Council cycle budgets too are vital. In particular they enable councils to double-up their cycling investment, if they then apply successfully for the government/Sustrans match-funding above. Measure & publish. Councils should obtain and publish data to help decide what cycling projects would be most useful, to inform high-quality bids for the Sustrans match-funding, and to evaluate the success of projects. 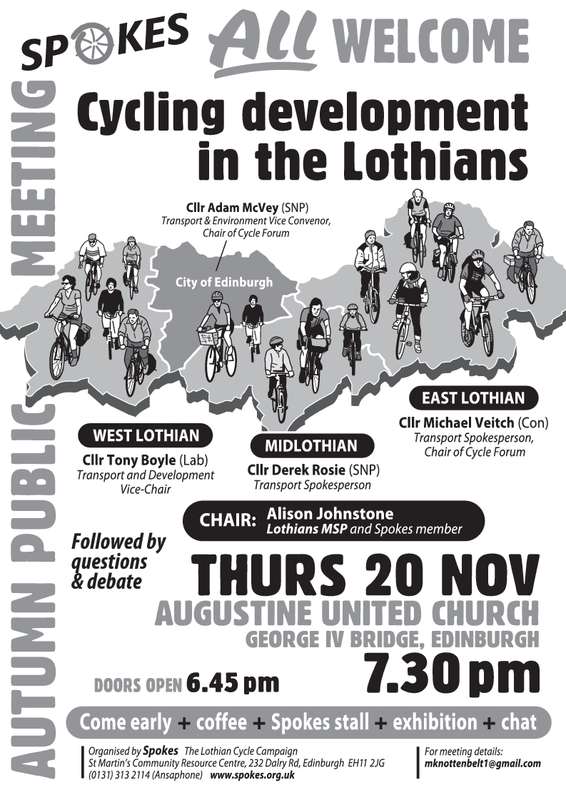 1 comment to Lothians interest – packed out meeting!